Perhaps a quivering child crawls in the psyche of our slam-your-fist-on-the-table society. Perhaps greed is a symptom more than a disease. It’s the splayed claws of the wounded tiger, the adrenaline of the cornered fugitive, the panic-stricken roar of the captured lion. We’re more fearful than we’re greedy. 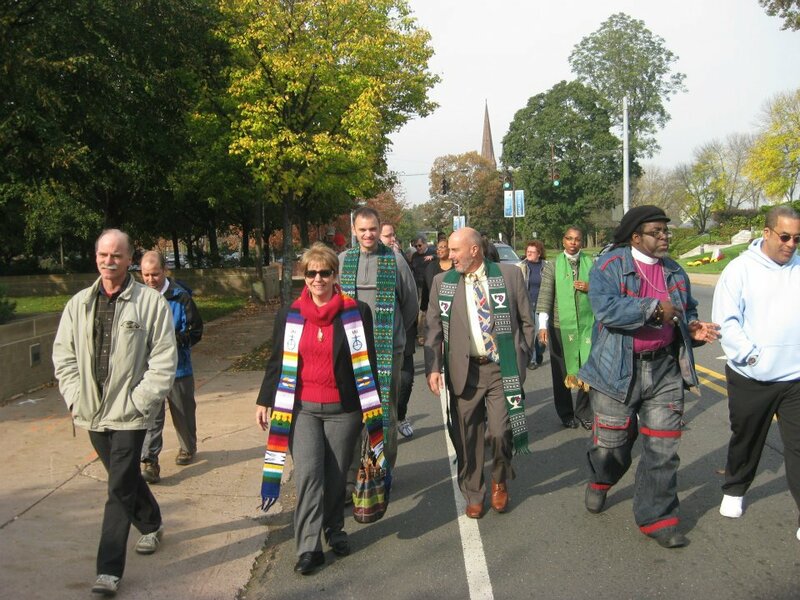 The clerical march was organized by The Rev. Alison J. Buttrick Patton of Simsbury and Bishop John Selders of Hartford – both from the United Church of Christ – after they heard a “shout out” (Patton’s words) calling for church leaders to convene on Monday at 10:30 a.m. in every American city and walk to the nearest Occupy site. A Facebook page declared: “Many of us have been moved by the moral voices for corporate political accountability.” Now was the time to put our best foot forward. Literally. I heard the feint whispers of fear while the clergy gathered. There was an imam, a Unitarian, and a host from the UCC. I was the lone evangelical. What would my tribal colleagues think? What would these people here think once they learned I was a theological Neanderthal? I knew the whispers were laughable: I mingle among theological liberals all the time and almost always find “them” welcoming. Indeed, Patton took her turn before the reporter and then urged me forward. There I was, being recorded for the evening news in my moment in the sun … and … The whispers blared into screams. I once stumbled over the trip wires of political correctness in a previous congregation and ignited a chain reaction of late-night meetings and subtle charges of anti-patriotism. My current church is far more lenient, but … you never know … I have a wife and a son and a home and a pet rabbit and bills to pay and cars to fix — and then there’s the back porch begging for repair. I can’t afford to lose this job. That’s when Proverbs 29:25 flashed: “The fear of man will prove to be a snare, but whoever trusts in the Lord is kept safe” (NIV). And Romans 8:15: “For you did not receive a spirit of slavery to fall back into fear, but you have received a spirit of adoption” (NRSV). And 2 Timothy 1:7: “For God did not give us a spirit of cowardice, but rather a spirit of power and of love and of self-discipline” (NRSV). I cannot escape the insinuation: Fear is a “snare.” It is quicksand. It holds us captive and nurtures distrust in God. We conceive of ourselves as orphans, not as God’s children. It robs us of God’s power and dams the inflow of his love. We lack discipline (witness today’s wild tempers). We are, to put in bluntly, disobedient. I couldn’t help but wonder: Am I the only one? Where are my kindred evangelicals? Do we not implore our people to walk the path of Christ and mingle among the disenfranchised? Do we not make appeals for them to seek openings for the Gospel? 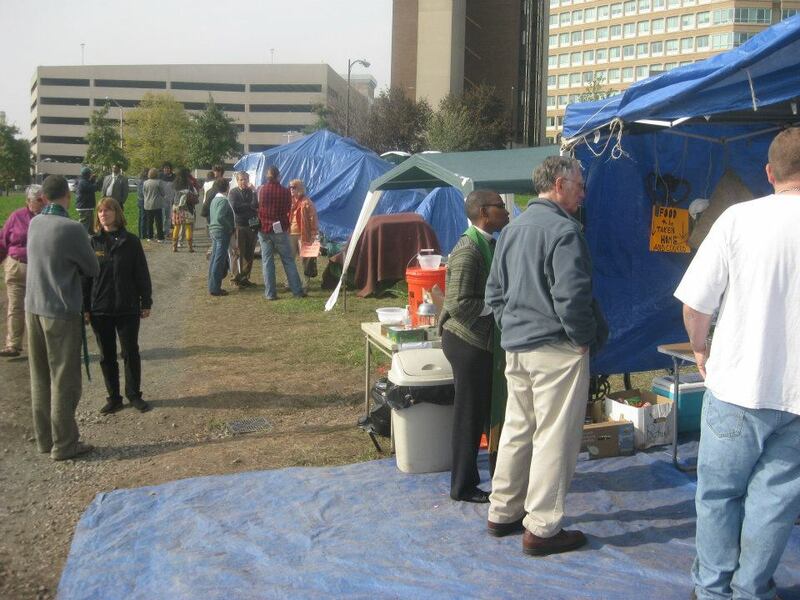 Surely we can commend the “Occupy” movement for highlighting America’s golden calf: Greed. Are we so afraid of the tent-dwellers that we’ll not reach out to them? Or are we draping ourselves in those seductive excuses: We have families and pet rabbits and back porches. We’re free to disobey Proverbs 29:25, Romans 8:15, and 2 Timothy 1:7. 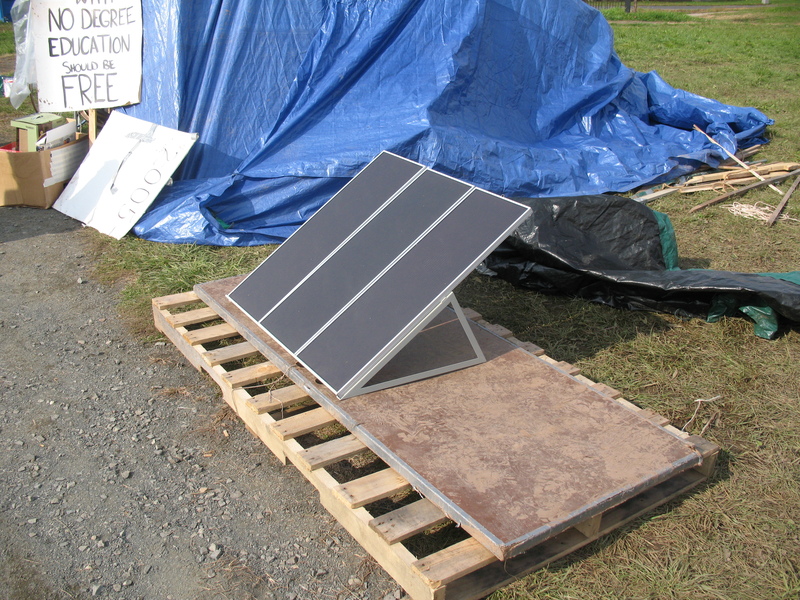 We reached the tent-dweller village, complete with a media center powered by solar panels as well as tents for first aid and information. Introductions abounded between the garbed clerics and the blinking, weary occupants. The imam prayed and three of us spoke, including me (I thanked them for highlighting greed and I confessed evangelicalism’s sin: We’ve become so greedy ourselves that we’ve lost our credibility). Then some of them spoke – and I heard our chains fall as I listened: One told of his 10-year bout with homelessness. He feared little because he had little to lose. Another, named Moses, boldly proclaimed that we have nothing to fear from the devil. Preach it, Moses. There was a 24-year-old named Sean, who said he didn’t go to church but constantly cited the Gospels as he thanked us. Others spoke — including sympathetic suburbanites who come during the day and drive home at night. Some were veteran radicals; others were new sympathizers. All told compelling stories – but I couldn’t help but focus on Sean and those two homeless men. They had little to lose and, therefore, little to fear. I refuse to romanticize their story. Homelessness is dangerous – especially in New England winters. I know that people with knives prowl the shelters and I know that homeless people die at younger ages. But those realities could not smother the living allegory before me: Our things — including our pet rabbits and our back porches and our houses — can turn on us and own us. They make us hold back and cover up our tracks with a series of yeah-buts (“yeah, but this … yeah, but that”). We shun the microphones and hug the sidewalks, unaware that fear is curling around us like a python and strangling out the love (notice the juxtapositions in 2 Timothy 1:7). Perhaps we should stop slamming our fists. Perhaps we should allow ourselves to feel the coiling snake. Perhaps the child will stop quivering when we peel it off. We can breathe in God’s love once more — and the child will smile as the greed fades. J. Christina Hodgson Very well written Chuck. You made ME feel the fear as you recounted the niggling voice telling you to protect what you have, play it safe, not speak up. It’s great that you have the awareness to recognize fear when you feel it, so you can tell that your freedom is being choked and then make a grab for freedom after all. People do pay high prices for security, I know. All of us are prone to worrying what will happen to us if we say the thing our colleagues won’t tolerate. 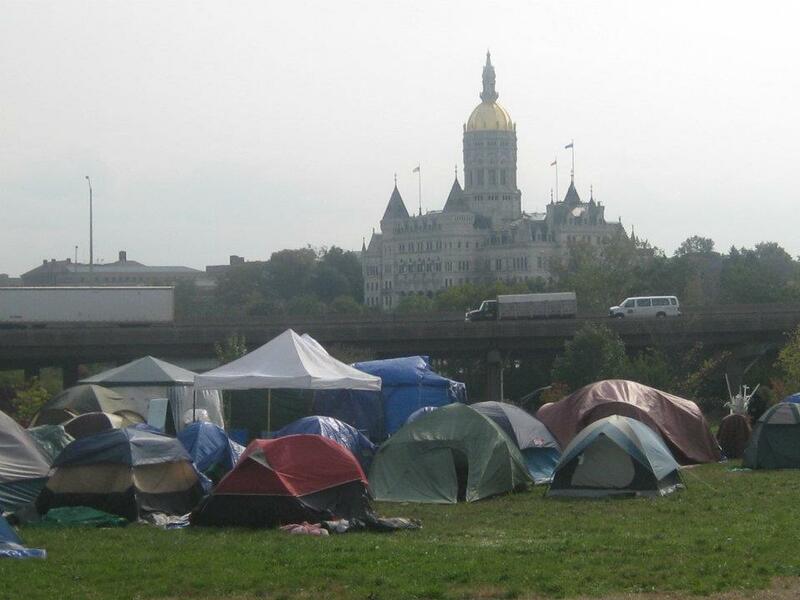 And congratulations to you for going to Occupy Hartford. 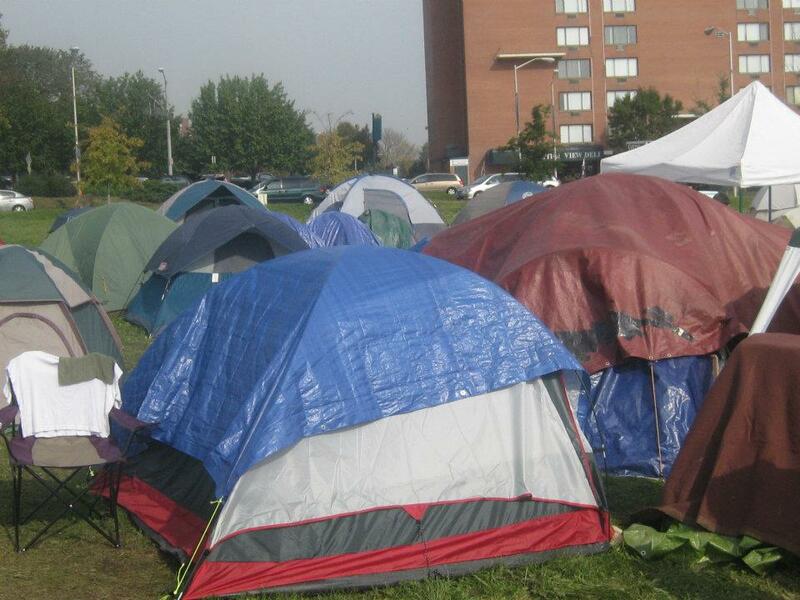 I have not been to any Occupy Boise events yet, but it may happen in the weeks to come. At least I’ve taken the first step, downloading their calendar. J. Christina Hodgson For others here at Basileia / The Kingdom, I am looking through other articles on Chuck’s blog, The Alternative Mainstream. J. Christina Hodgson By the way, on this group (if you scroll down the page quite a ways) there’s a note entitled “A Few Thoughts on The Kingdom.” It is about Jesus’ parables describing the present-and-becoming kingdom of heaven. Also some remarks on the “gospel according to Jesus.” Anyway, amid all that, the connection between fear and selfishness is mentioned. If people can manage to get beyond their terror at the thought of not having enough for themselves and their family (and enough is a highly subjective quantity), then it becomes easier to be generous with others, to look around for who needs help, and to do something. As a non American, I couldn’t quite understand why going to the protest would put your livelihood at risk. I was drawn to a couple of your comments which stood out. It was this ^. This sent shivers down my spine. Have you answered that question yet? Chuck Redfern Lisa: There are several answers to this. First, many have honest disagreements with the Occupy movement (I can’t ignore that); second, the Occupy movement is largely associated with the political Left and most evangelicals consider themselves political conservatives (I’m in the minority). But third, I think many evangelicals have a siege mentality and approach issues with an attitude of fear. We fear those with whom we disagree and refuse to mingle with them. Evangelicals are not the only ones. I know many who lob verbal shells about evangelicals from the safety of their own camp and then cloak themselves with such phrases as “open-mindedness:” i.e., I’m open-minded and you’re not, therefore you are intellectually inferior. It’s easy to lob shells from the distance. We might have to change our assumptions if we walk up close and our pride will diminish. Concerning your comment on “nationalistic zeal,” I totally agree. Many evangelicals fail to grasp that we wrap ourselves in civil religion when we align ourselves with one particular political party. I praise God that not everyone bought that line — and there’s been a shift. More and more are shedding civil religion. Feel free to put these comments on the blog itself. I have noticed that about the US culture in general and I’ve noticed all the emotive hot words used by the corporations to instil some pretty strange associations. Somehow, somewhere, social responsibility to the weak and vulnerable in society and the story of David and Goliath gets twisted into something sinister and completely opposite. It is indeed very disturbing when Nationialism and religion are mixed with politics. It does make me wonder what they teach about history in US schools. I’m not sure you want my comments on your blog. If your congregation reads it, it might get ugly. Chuck Redfern Go ahead and put the comments on the blog. People in my current church have seen it and have had a good laugh. It was the previous church that was the problem.